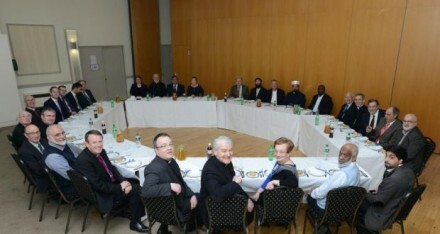 An unprecedented meeting of senior figures from the major faiths in Ireland has taken place at the Terenure Synagogue Hall in Dublin, as religious representatives gathered for a meal together. The event was organised by the Jewish Representative Council of Ireland. Among the 30 guests were papal nuncio Archbishop Charles Brown, the Catholic Archbishop of Dublin Diarmuid Martin, the Church of Ireland Archbishop of Dublin Michael Jackson, retired Church of Ireland primate Alan Harper, Rev Dr Alan Martin and Dr Sam Hutchinson of the Presbyterian Church, and Dr Andrew Doughtery of the Methodist Church. Also present were Dr Nooh Al-Kaddo and Shaheen Ahmed of the Clonskeagh mosque, Sheikh Yahya Al-Hussein of the South Circular Rd mosque, Dr Ali Al-Saleh of the Milltown mosque, Dr Ihab Ahmad of the Cork City mosque, Rabbi Zalman Lent, leader of Ireland’s Hebrew congregation, and Leonard Abrahamson, president of the Jewish Representative Council of Ireland. Mr Cohen said that while the group tended to bump into each other at civic ceremonies, “we do not really know one another well enough to stand together in times of crisis”. Mr Cohen said that for people in Ireland “to be of any help, I feel we need to focus . . . on creating a unity of purpose in the minds of people. This means that room needs to be made by people and not just for people”. “We must see what happened in the not-so-distant 1920s and 1930s in Europe. Mr Cohen said that what is required is “a paradigmatic shift of thinking in Ireland”.